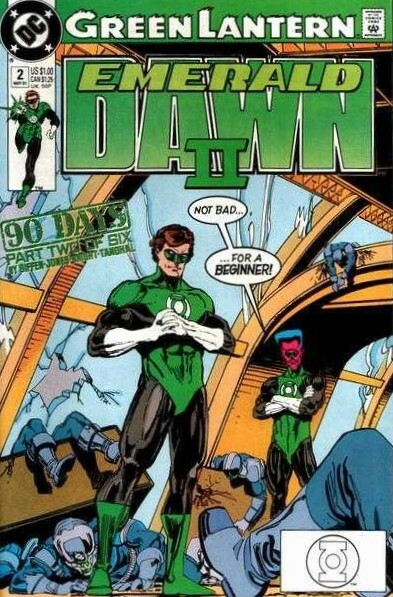 "90 Days, Part II: Balance of Power"
When last we left our hero he was visited by his fellow Lantern, and new trainer, Sinestro. As we open, a prison guard who just happens to be passing by can't help but to notice the emerald light spilling out of inmate Jordan's cell. As he approaches, Hal convinces Sinestro to make himself scarce. After nearly being caught, Sinestro tells Hal that it's time to split. He finally convinces him by whipping up a Hal Jordan shaped construct in his bunk... and does so without leaving a glowing green residue. At this point in his ring-slinging career, Hal cannot perform such a feat. The two Lanterns-in-arms leave the prison. Sinestro attempts to instill in Hal that he must trust his ring to get him through tricky predicaments... such as weaving through a meteor storm. The theme is harmony, and Sinestro intends to show Hal how a true Green Lantern handles things harmoniously. In a skyscraper on a far-off planet in Sector 0131, representatives of various alien races, including the Khunds, the Citadel and the Dominators are discussing forming a mutually beneficial alliance. They intend to pool their vast resources and strengthen their intergalactic influence. Shortly, the Lanterns arrive at the high-rise. After having the situation explained to him, Hal is shocked... and appears to be ready for a fight. Sinestro tells him to settle down... he's just there to watch. This situation must be handled with diplomacy. Inside the office, Sinestro pleads his/the Guardians' case. He encourages the faction heads to "find an alternative solution" and offers that if they do not, the Green Lantern Corps may find themselves having no choice but to intervene. The heads ain't impressed, and as such chuck a desk in Sinestro's direction. This causes Hal to step in, and start throwing ring-construct-fists. Sinestro is shocked... and annoyed at Hal's impetuousness, which, quite honestly is fun to see. Sinestro throws up a protective barrier around the alien leaders while Hal... blows the roof off the place, sending many an alien flying... right into some conveniently placed construct-spoons. At this point, all hopes at a diplomatic resolution are lost... and a battle rages. Hal manages to save Sinestro (who he calls "Sin", much to his trainer's disgust) from an attack from behind. Ultimately, Sinestro impresses upon the alien goons that if just one Lantern can bring such fury... imagine what would happen should the entire Corps come down on them. The aliens decide perhaps putting off their alliance would be best for all involved... until the Lanterns are comfortably outside the sound of their voices, at which point it's made crystal clear that on this day the Lanterns have made some dangerous enemies. As li'l Willie attempts to climb up to his bunk, he accidentally steps on... and through his cellmate('s humanoid construct), and falls flatly on his back. Moments later after parting company with Sinestro, the real-deal Hal Jordan pops back into the cell in full Green Lantern glow. Hand on his head, poor polite Willie is shocked! Another fun issue of Hal Jordan's early days. Having come into my Green Lantern reading during the early-mid Kyle Rayner years, I really didn't have much of a frame of reference for Sinestro. All I knew was that the power-mad Hal Jordan broke the poor guy's neck during Emerald Twilight. I feel as though this issue gives a really good primer on who this guy is/was and what makes/made him tick. Having Sinestro actively holding Hal back... encouraging him to think things through, and act diplomatically rather than fists-first was a real treat... and not something I expected. Hal being headstrong to the point of actually being dangerous really works in the pre-Green Lantern: Rebirth landscape, and almost makes his shift into Parallax feel (at least somewhat) organic. Great issue, great fun... great cliffhanger. This issue even made the random DC Comics alien goon squad seem interesting... which, for me is big. The lame, and in-my-mind interchangeable alien races of the DC Universe have always bored me to tears... this issue made them work. What more can I say? Giffen, Jones, and Bright continue to bring the goods in this underrated little tale. Worth a look!